The dinner dance went well the night before and with a late start there was plenty of time to enjoy the full works breakfast before the race. It was a lovely bright morning but perishingly cold. Your webmaster has to admit to getting a few strange looks from the citizens of Brockenhurst as he scraped the car windows dressed as an angel. The next delay for many people was the flood under the railway bridge. Whilst some intrepid members drove through, the more sensible ones took the detour. But Mick coped brilliantly with the inevitable delays and it was a lovely run with convivial chat afterwards and at the pub. "The attached results (Excel spreadsheet) have tabs for the order by overall time and also the handicap difference. There were 10 runners who were within 1 minute of their predicted time with Lynda Massey only 7 seconds faster than her 53:20 prediction. The lanterne rouge was won by Denise Nelson-Bellehewe who kept Anne Bruce Low company. 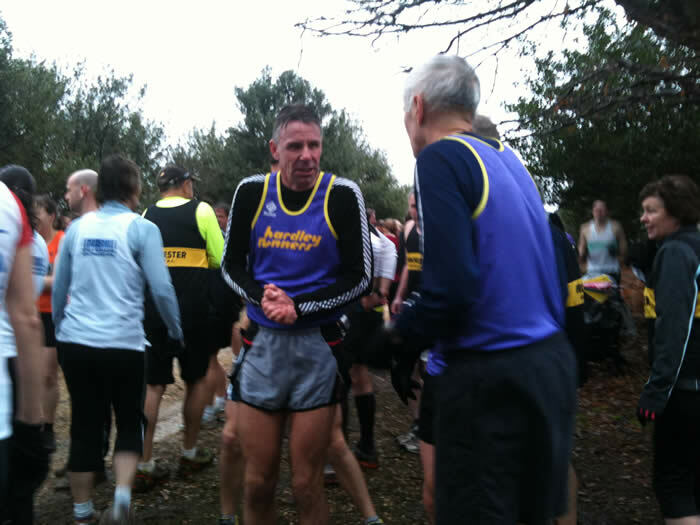 Andy Kellaway was fastest runner in a creditable 37:41 on a very cold morning. Sue Sleath was fastest lady despite suffering from a bug. The fancy dress prizes were won by Jeremy Barber in his angel costume with Jenny Jewell as a snowman and Mary Corbett as a pink fairy sharing the ladies honours. Many thanks to Jeremy for his hot refreshments and to all who helped to make the annual Hardley Runner's Handicap an entertaining event." Thanks very much to Eryl Penney who took the pictures and Malcolm Price who sent them to us, here's an album showing most of the runners including the fancy dress runners in action. Malcolm also wrote an article for The Echo. If you have any more pictures please email them to me and I'll add them to the album. It was a damp and windy day for this popular 10K which was started by weather presenter Alexis Green who also ran and finished in 42:27. As always there was a good Hardley turnout. After a nice warm up at the South of England Masters the previous day (see News tab) Malc Renyard maintained his form and was first MV65. Well done! Hardley results are below. You can see the full results here. A good Hardley turnout and an excellent course on an overcast morning. Plenty of mud and hills. Hardley results are below. The full results and some excellent photos are on the CC6 site (see Links tab above). 29 John McKenzie V50 65 Geoff Harris V60 87 Geoff Mills Super V! Another good turnout by the men. Going was good on a grass the whole way as the bit in the woods was not included this year. The sun shone brightly but there was a cold wind. Hardley results are below. Our Men are 6th in Division 2 and out Vet Men are 7th in Division 1 after this race. You can see the full results here. After a misty start it was a beautiful sunny morning for this HRRL race. Almost too hot which is amazing for a race on 20 November. It was good to see we had full teams for both women and men. Hardley results are below. Congratulations to Nick Newton who was first M55. You can see the full results here.There will be a full analysis on the HRRL site (see Links tab above). What a lovely morning for our CC6. Thanks very much to everyone who helped. Hardley results are below. Full results and some excellent photos are on the CC6 site (see Links tab above). There was a good turnout with 7 Hardley men competing including 6 vets. After this second race our senior men are have moved up one place to 6th in Division 2 and our veteran men have been overtaken by Winchester are down one place at 7th in Division 1. Well done. You can see the full results here. There was a good Hardley turnout for this HRRL race with 17 members taking part. Hardley results are below. You can see the full results here. There will be a detailed analysis on the HRRL site (see Links tab above). Hardley members are regulars at the Original Mountain Marathon but numbers were down a bit this year as the venue was the hills surrounding Ben Chonzie between Loch Earn and Loch Tay which is a bit of a long way to travel. All our runners were in the medium score orienteering event which gave them six hours on Day 1 to visit as many checkpoints as possible carrying all the camping equipment and food for the overnight camp on the somewhat damp ground at the head of Loch Lednoch. Conditions were very showery and everyone retired early. Sunday dawned brighter with lovely views of the patchwork picture of heather, bracken, moss, rocks peat and burns in the morning sunlight and five hours to collect more points with severe penalties for being late. Highlights for your webmaster included surviving, red deer, grouse, a blue hare and the wonderful support Roger gave to his OMM virgin partner. Low point was the hour spent fruitlessly combing bogs and streams for a 30 pointer that must have been around somewhere! There is a handicap system so Vets get an extra 1.5% for every year the age of the two person team exceeds 90. This year the sole Hardley competitor was Dave McElhenny who finished 178th out of 312 in 1.09.25. Click here for more information about this very scenic 12K race. What a lovely race. Stunning scenery, challenging nine mile undulating course, friendly and efficient officials, beautiful sunshine, scrummy cakes, buffalo burgers and bar. I could go on but you get the idea. Definitely one for next year. Hardley results are below. You can see the full results here. There was a good turnout with 8 Hardley men competing. After this first race our senior men are 7th in Division 2 and our veteran men are 6th in Division 1. Well done. Hardley results are below. You can see the full results here. What a lovely morning for the first CC6 and an excellent Hardley turnout (22 men out of a field of 92 and 11 women out of 60). Conditions were good with enough mud to make it interesting. Congratulations to Sue Sleath who was first lady. Hardley results are below. Full results and some excellent photos are on the CC6 site (see Links tab above). 25 September was a good day for Hardley with members competing at three distances. 10K at Hursley, the New Forest Half and full marathons at New Forest and Berlin. And it was a good day for running with lots of competitors of all abilities. All we need to do is recruit some of the many unclubbed. When they see how lovely we are at the Solent Half I'm sure they will flock in. Congratulations to everyone who turned out. Hardley results for the Hursley 10K are below. You can see the full results here. Conditions were good for this perennial favourite but opinions varied as to whether doing in the other direction was an advantage. Most thought it was but your webmaster found the long uphill stretch at mile 10 (previously the nice downhill stretch at mile 4) was hard going. It was good to see the Ratcliffe family out in force. Congratulations to Jane whose battle with Jim in the closing stages led her to a new best for the event and a narrow victory on the line. We won't mention that Jim was a second ahead on chip time becuase it is gun time that counts. Hardley results are below. You can see the full results here. And here's an album of pictures from Guy Lawrenson. A fast flat course and conditions were pretty good for the second race in the Hants Road Race League. Well done to the women who had a full team. Sadly the men were one short. Hardley results are below. You can see the full results and some analysis on the HRRL website (see links tab above). Martin Loveless writes, "A clean sweep for Hardley in the 17 miler - first 3 men and first woman - easy this running lark - just need to pick a low key race with few runners in it and make sure the quick boys in front get lost. Unfortunately one of the quick boys was Dale who got lost twice - another candidate for the navigators hat methinks!" You can see the full results here. The lone Hardley competitor (so far as I am aware) was John McKenzie who writes, "Weather was OK, a bit windy at times, but the rain held off and made me wish I had opted for the vest rather than t shirt. As for the run, I set off alongside an old chum with the intention of jogging round together in 3:30. We reached halfway in 1:49 so I dropped him off at a water station, made the twenty mile point in 2:39 and turned back into the wind to scamper over the finish line in 03:30:44 (chip time 03:29:32). No drama and a respectable time, so I'm happy. The nosh in the goodie back was disappointing so I stopped at a garage but, being a Sunday there wasn't a great deal of choice. I would not recommend Red Bull and Scotch Eggs as a post-marathon repast!" It was Hardley success for the second month running in Longparish. Mike Sleath broke his handicap by nearly three minutes to finish first overall and took the cup for Most Improved Man. You can see the full results and an album of pictures here. 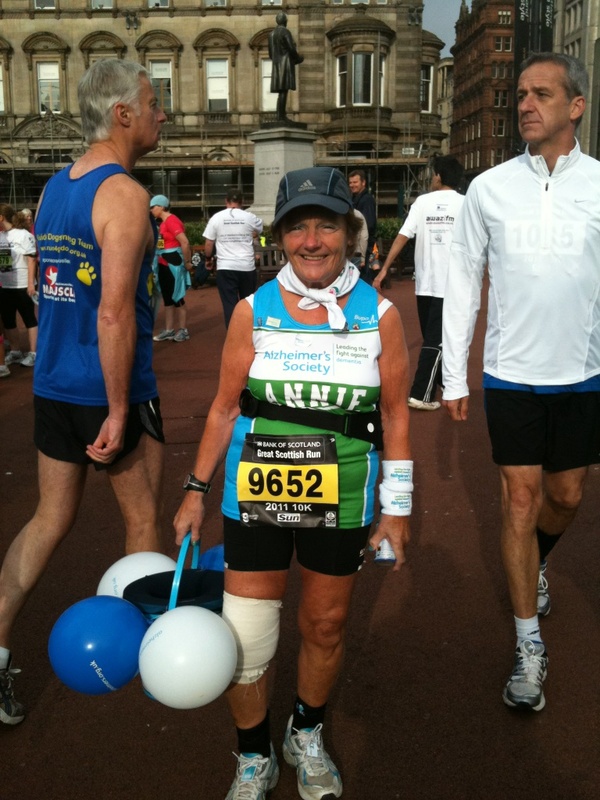 Annie Bruce-Low travelled to Glasgow for this race and, weighed down by her Alzheimer's collecting bucket, came in 7036th (19th F65) in 1:36: 29. You can see the full results here. Click on the thumbnail to see the full picture with bucket and balloons. The rain stopped before the start and the going was good for the 18th Beast. Numbers were down a bit (perhaps because of the poor weather forecast) so the queues at the two pinch points were much reduced. There were some smashing views, challenging steps and lovely Tee shirts for all. Hardley results are below. You can see the full results here. There was one Hardely entrant in this scenic and undulating trail race formerly known as the Stansted Slog. Lisa Lewis finished 49th in 2:05:24. A new PW for a road half Mr Loveless but it has to be said that the course was far from flat. Hardley results are below. You can see the full results here. The tarmac was barely cold on the new road surface. A fast first 5K but a bit of undulation in the second half. Hardley results are below. You can see the full results here Congratulations to Geoff Mills who was first MV70. Not bad for a 79 year old! Talking of examples to us all, special mention must also go to New Forest Runner Bruce Davidson who finished in 89 minutes, a bit under his age of 90 years. It was a dull evening and the grass was damp from earlier rain. It was good to see John Simmonds racing again after a long period of injury. Hardley results are below. The full results will on the RR10 website (see Links tab above) on Thursday evening. The poor light made photography difficult so here are the best of a poor bunch of pix. Various Hardley Runners stayed over after the Test Way Reccy and joined in the 57th edition of the L2SOTM. It is a handicap race with start times arranged so that (at least in theory) everyone finishes at the same time. The placings suggest that 17 miles, five pubs and a barbie the day before may have hampered some performances. Best Hardley performance was from Teri who took the cup for the Most Improved Lady. Terry was delighted as she has never won a cup before. This popular event caters for both walkers and runners and allows you to count yourself down over 5 rivers, 4 hills, 3 large country estates, 2 castles & 1 cathedral with 404 ft spire. Walkers included Peter Bruce-Low (5K) and Fiona Gould (20K). The weather was very hot, relieved by the odd cloud and breeze and the escape under the trees. Conditions were hot for the Ultra Tour of the Lake District and this had an adverse effect on competitors. Times were slower than last year, the drop out rates were higher and lots of people felt or were sick from the heat. 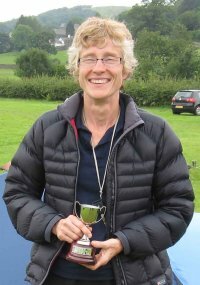 So I am delighted to report the wonderful news that despite sickness and a fall and after a sprint finish (can you imagine that) Hardley's own Sue Sleath was second lady in her first attempt at the gruelling Lakeland 100. Her time of 30.07.17 is a great credit to her ability and hard work and leaves a bit under 8 minutes worth of unfinished business for next year! * the two teams, Lulu, Paul and David and Andy, Dave and Jeremy who supported each other through thick and thin. Romsey Road Runners and Wessex Road Runners arranged an excellent new course, about 4.8 miles, looping among the trees on gravel and grass tracks with some muddy bits and about 500 feet of hills. The rain stopped just before the start and it was a good run though sometimes a bit gloomy under the trees. Hardley results are below. The full results are on the RR10 website (see Links tab above). It was a cool, wet and windy day for the Swanage Half. The course is challenging with lots of hills and a lovely finish along the sea front. For the two Hardley entrants this was the last hard long run before the taper for the Lakeland 50. Hardley results are below. You can see the full results here. The first and only (that I know of - if you were there too please email the webmaster) Hardley finisher was Mike Sleath in 2065th place in a time of 1.01.04. Well done! More information here. As always an excellent race, well marshalled and with stunning scenery. This year the weather was good for running too and at least one of our members managed a PB for the course (well done Martin). It was good weather for April but pretty poor for July for the seventh RR10 at Fleming Park. The course around the old golf course was lovely under foot with springy grass. The odd spots of rain saved us from overheating and our friends from Eastleigh turned out in force to marshal and encourage us. Thanks very much. Hardley results are below. The full results are on the RR10 website (see Links tab above). Here's an album of Hardley pictures. There are lots more excellent pictures on the Eastleigh RC website. 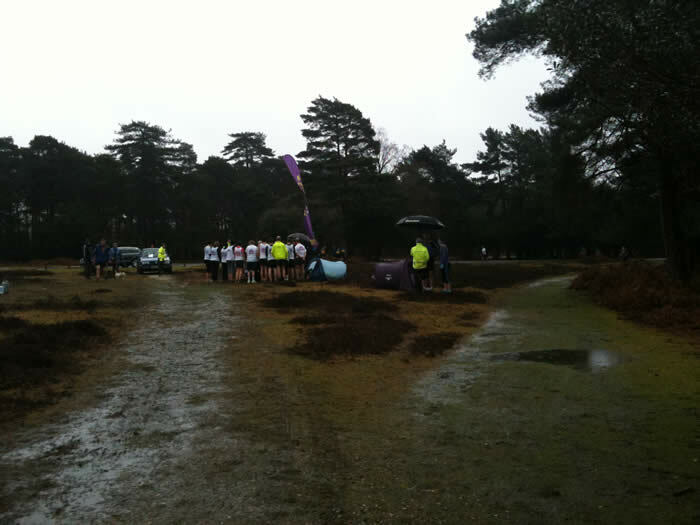 Running in the beautiful New Forest, the competitors enjoyed the near perfect weather – just a little too warm to run in! Next Race in the Runningtree Series is the Everton 10k on Sunday 21st August. Hardely results are below. You can see the full results here. The Charmouth Challenge is the most southerly fell race in England. The 8 mile course goes through some of the finest coastal scenery in the South West. It includes an ascent of Golden Cap, the highest point on the south coast of England at 191m. It was lovely weather for the Hardley camping weekend. The run is a good challenge and the heat made it all the more so. Hardley results are below. You can see the full results here. Incidentally the club is down as Harley Runners in the results which brings the delightful picture of doing the Golden Cap on high powered motor cycles. As last year's winners we were hosts of this year's event which was held on the track at Applemore. The format is a 10 leg relay over a 'metric mile' (4 laps each) with teams from local clubs. You can see the full results here. Our team were the winners. Well done! Click on the thumbnail to see the big picture of some of them. Thanks very much to Applemore College for hosting the event and all of those clubs that raised teams and generously donated to Terry's charity which should receive £140 once all the donations are in. The very hot weather made it hard going. Well done to who ran and particular mention to Viv and Malc who were first in their categories. Hardley results are below. You can see the full results here. Thanks very much to our Stubbington Green friends for organisng this new course which was two laps, gently undulating in woods and fields. No dust this time. Torrential rain earlier in the day left the course very muddy but it cleared for the race though it was a bit gloomy under the trees. The course was challenging but Hardley members rose to the challenge and but there were mixed reports as to whether they enjoyed it! Hardley results are below. The full results are on the RR10 site (see Links tab above). Annie took a couple of snaps which you can see here. This race lived up to its name of The Hardest Half so it was good to see both Hardley members in the top 10%. Sadly that was the top 10% in terms of age rather than finishing place. Martin was 3rd MV50 - well done - and we both improved on our previous perfomances despite the course being slower this time. And it was good preparation for the Lakeland 50 (four times as far but a bit under four times the climbing). The views were excellent and so were the tee shirt, mug, medal and post-race picnic but the ground was slippery and the hills were hard, especially the one with 275 steps that we had to go up and down twice. Where were all the youngsters? Hardley results are below. You can see the full results here. Great course as normal but for some reason a much smaller field than in previous years - maybe the removal of the cheap fares on the iow ferry due to the clash with 'gaffers' weekend had something to do with it. The weather was cooler than in recent years but luckily the runners missed the worst of the rain. Congratulations to all for being 3rd team and to Martin who is going well in his build up to the Lakeland 50 and was 2nd MV50 in a PB for the course by 5 minutes. Hardley results are below. You can see the full results here. There was an excellent turnout for the 4th RR10 with 49 Hardley members taking part. Conditions were good and the pace was fast though the hard ground made some parts a bit interesting. Hardley results are below. The full results are on the RR10 site (see Links trab above). Running across the short stretch of Atlantic beach towards the lone piper in the distance might not be great for your PB, but it's fantastic for your soul! Perhaps because it is a little way from Hardley, we had only one runner in this race. Congratulations to Sonia Robins who, despite the wind, finished what was only her second 1/2 marathon in 135th place in a creditable 1.56.42. Despite the weather forecasters predicting a dull day, this year's race turned out to be a comfortably warm event, if a little breezy in the open. Hardley results are below. You can see the full results here. After last year’s hot temperatures our 2011 runners enjoyed cooler conditions and the odd shower. Hardley results are below. For the full results click here. We had two Hardley members in the Edinburgh Marathon on Sunday which was blasted with a gale force headwind for the final 8 miles! Despite that both Viv Alexander and Brendan Anglim managed to run virtually even splits which contrasts with the majority of the 9,000 finishers. Viv ran 2:23 and 4:46 while Brendan was not happy with his first road marathon times of 1:30 and 3:02! There was a good turnout for the third RR10 with 41 members taking part. A shower had settled the dust and it was pretty chilly. That and the good conditions underfoot encouraged everyone to go fast on a course which was scenic and well marshalled. Hardley results are below. The full results are on the RR10 site (see Links tab). 12 members ran in this last race of the HRRL season on a fine day. 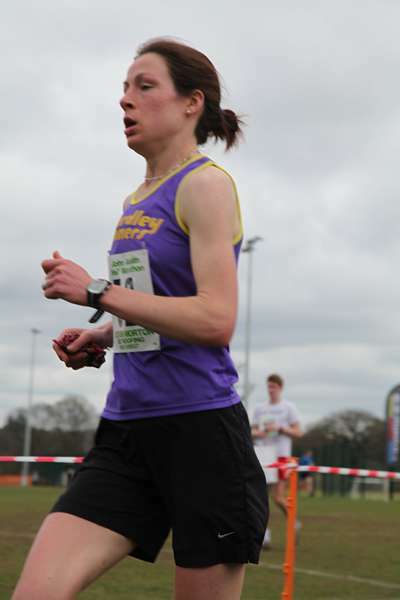 Hardley results are below and you can see the full results here The league will be updated shortly (for link see Links tab above).The only person to have completed the necessary 7 races out of 12 to qualify for an individual league place was Tara Anglim. Well done Tara! Let's hope we have a few more next year. There was a choice of three events with 33 and 20 mile runs and a 20 mile walk. This was your webmaster's first ultra (part of the build up to the Lakeland 50) and it was an interesting experience. The overwhelming impression at the start was of very tanned men with muscles, cropped hair or shaven heads and tattoos. Oh Lord! What are we letting ourselves in for? But pitted against them was someone completely different; slightly built, blond and clad in black, Hardley's own Amazing Wilson, Sue Sleath. Sue has competed in this race seven times and every time she has been faster then the previous time. Fresh from her 52 miles the previous weekend, Sue did it again. She was first woman and ninth overall, half an hour ahead of the next woman, in 4 hours and 40 mins. Well done! By the time your webmaster finished the hard men and women had long gone. So what was my impression? It was a great day out. Very well organised event, plenty of checkpoints on the 33 miles, navigation pretty good with one minor crisis. The marshalls were all friendly and encouraging. Great mix of countryside on the route, canal, bluebell woods, fragrance of wild garlic and the white horse on the downs and through Avebury before the last climb to cross over the Ridgeway. Then a long downward slope to the finish culminating in a final 200M sprint where I just kept ahead of a chap from Winchester and managed to break the crucial seven hours. A lovely hand made mug and food at the finish. Hardley results are below. You can see the full results here. And here's a blog which describes the race in more detail. There was a good Hardley turnout for this HRRL race with full teams for both men and women. Although there was a strong wind the conditions were otherwise fine for this tough undulating course. The last League race is the Royal Victoria Country Park 10 km at Netley this Sunday - 15th. Entries are being taken on the day and a good turnout may help our overall positions for the men's and ladies' teams so please come if you can. Hardley results are below. You can see the full results here. Congratulations to Mick who was first MV60 by two seconds. Now in its 10th year this run follows country lanes and the flat coastal path along the sea wall with fantastic views across the Solent to the Isle of Wight. Hardley results are below. You can see the full results here. There was only one Hardly entrant in the 52 mile Malvern Hills Ultra but didn't she do well! Running as part of her build up for the Lakeland 100 and only six days after the Three Forts Marathon, Sue Sleath smashed the women's course record by over an hour to finish 6th overall in 10 hours and 2 minutes. You can read the race report here. Have you ever watched one of those nature programmes where a herd of wildebeest stampede across the Serengeti raising a huge cloud of dust. Well for those of us at the rear of the field the RR10 was a bit like that. With no rain for the previous month the forest was (literally) dry as dust. That made conditions fast and, thanks to our Totton friends, we had an excellent race. Overall turnout was large but Hardley turnout was down a bit with 25 men (34 last year) and 13 women (20).These are great races and the next one at Wilverley is particularly nice so do come along on 18 May. Hardley results are below. There was a bit of confusion at the finish as one runner missed getting a number so yours may be one different from what you recollect. The full results are on the RR10 website (see Links tab above). Another scenic marathon; this time from Avebury to Stonehenge and another of our Lakeland 50 entrants getting some miles in. Hardley results I know about is below. Were there any others? The results don't show clubs so it is difficult to analyse them. This one is a marathon and a bit with 27 miles of mixed terrain and climbs of 3450 feet in the lovely scenery of the Downs North of Worthing. It was a sunny and breezy day so the drinks stations were very welcome. Hardley results are below. You can see the full results here. The course is an undulating/hilly very scenic single lap of 8 miles with approximately 900 feet of ascent taking in Golden Hill Fort, Freshwater, Headon Warren, Alum Bay, Highdown, Tennyson Down, Freshwater Bay and back to the finish at Freshwater. Hardley results are below. Congratulations to Viv and Mick who were first in their categories. You can see the full results here. It was a lovely, fine, sunny day for the Compton 20/40 but the unseasonally hot weather made it hard going for the six Hardley runners who took part. Well done all and particular mention goes to Sue Sleath who was first woman in the 40 and to our men who were first team in the 20. Hardley results are below. You can see the full results here. It was a lovely evening for the first RR10 but the traffic was even worse than usual. Your webmaster, who took over 15 minutes to get off the motorway, was very glad that the organisers delayed the start. The course had a new variation - a loop down to and along the beach; shades of The Grizzly, hard work and much more fun than the there and back again bit to the cemetery it replaced. Hardley results are below. The full results will be on the RR10 website (see Links tab above) on Thursday. The next race at Ashurst on Weds 4 May is always a favourite with Hardley members. The day after London Mike Roberts ran Boston with metronome like efficiency (see splits below) to finish in 3:04:38. Well done! Well done to all seven Hardley runners who completed the London Marathon on a very hot day. Special mention goes to Anna for very consistent running when everyone else (well apart from the leaders who finished before it got properly hot) was slowing substantially in the second half. Your webmaster writes, "It was an interesting experience. Extremely hard work and very hot. Very supportive crowd and great atmosphere but I don't recommend 44 miles of hills as part of the last week of taper! I stayed at about 9.5 mins per mile for the first half and then the wheels started to fall off. Quads got more and more painful and at mile 21 I walked for a couple of miles to give them a bit of a break. Then back to a shambling run with a revised target of beating my neice Ruth's Paris time from last week which I just managed by three minutes. I expect because of the heat, the 9 minute group and the 10 minute group were both about ten minutes behind schedule when they passed me. First aid people were kept v busy with people who collapsed. Got to shake hands with Richard Branson at the end. All in all a good part of the training for the Lakeland 50." Ian Hawker writes, " This is a low key well- organised village run across stunning Hampshire countryside criss- crossing the River Test. It is a cycling, running or walking event. A Really friendly atmosphere with home-made cakes in the village hall. For those who like an off- road race it is definite one for any Hardley Runner next year. For me, one of the best local trail runs I've entered." A very pleasant event in Dorset organised by the Long Distance Walkers Association. There was a choice of 20 miles or 30. The route was very scenic with great views of the famous Cerne Abbas Giant. There were checkpoints every five miles or so offering drinks and everything from jelly babies and cake to pasties and rice pudding. You can see the route here. All in all an excellent low key event, well organised and highly recommended. Hardley results are below. You can see the full results here. Consistent with the LDWA approach they are displayed in entry number order not by time. Congratulations to Anna who improved her John Austin time of three weeks ago by over two minutes. Hardley results are below. You can see the full results here. Conditions were idea for the Eastleigh 10K and there was an excellent Hardley turnout for this HRRL race. The fat flat course led to some good times and the winner by the amazing margin of one minute and one second was John Beattie from Essex. Congratulations to Malc Renyard who was first MV65. Hardley results are below. You can see the full results here. What a lovely run. The weather was kind, the venue and the views were excellent and the gardens were lovely afterwards. Well done to all who ran and thanks very much to the organisers and all our lovely encouraging marshals without whom it would not have been possible. Congratulations to Paul Ashley and Anna Bentley who were first man and first woman, to our men who were first men's team and to Malc Renyard who was first V60. Hardley results are below. For the full results see the Exbury 10K tab above. Congratulations to Anna Bentley who was first woman and Nick Newton who was first MV50. This is a new race, orgnanised by Henry Szwinto of New Forest Runners, in support of Oakhaven Hospice. Feedback on Runners World is excellent so let's hope it becomes an annual event. One typical comment said, " A cracking local event which had obviously had a lot of thought put into it. Picturesque route (and one that did a fine job of disproving my belief that the New Forest is fairly flat), friendly atmosphere". The driving rain got less as we drove West and by the time we got to Seaton it was a lovely sunny day for twentyish muddy, hilly, boggy, beachy miles of the multiest-terrain running experience you will find this side of the end of time. Hardley results are below. You can see the full results on the Axe Valley Runners site And here is an album of pictures taken by your webmaster on the way round. As you will see from the results I had plenty of time to enjoy the views. A lovely day, a well organised race with cheerful marshalls; what more could you want? "Free coffee and tea at the start was nice. The weather started fine but even then the conditions were incredibly slippery, the weather then turned to drizzle and then steady rain, the tracks were like ice rinks, feet going sideways as much as forward, people slipping over all around though I managed to stay upright…..just, uphill was hard, downhill was just plain scary. I was going well and feeling strong considering until about mile 17 when my legs started rebelling, however kept them moving although not very fast. 400 runners, everyone friendly and in good humour, some very muddy at the end. The jetwash was in constant use even in the rain. Mile 11 and 16 water stations, there was fruit cake, tea, coffee mars bars, bananas, oranges. I rather overdid it at mile 11 so studiously ignored the mile 16 delights. After there was hot soup, coffee ,tea, hot chocolate and such lovely cakes, all free. I would really recommend this race, yes it does hurt ….a lot….but such a great day out, amazing views and countryside, friendly marshals most with bowls of sweets, and a great sense of achievement just for getting around. " Paul Ashley writes, " Having done this race 2 years ago I generally knew what to expect with some fairly tough running ahead. A very enjoyable run though starting and finishing at Sandy Balls in Fordingbridge. The course takes you along Hampton ridge with some tough ascents and descents. This was my first real race since September 2010 apart from a few 5k park runs back in November and a limited number of runs which never really went over 8-9 miles. Despite feeling fairly comfortable at this point the lack of miles soon kicked in at mile 10 and the last 4 miles where starting to get a tab uncomfortable. However I'd put in a fair amount of work to drop two fellow triathletes lying just behind me in 5th and 6th so pushed on hard to keep my position and stay in 4th. I'm certainly paying the price for it today though with a record 6 blisters and very sore legs much to the amusement of work colleges as I shuffle along. I'd recommend the race to others as it's a lovely course with good facilities for changing etc and free hot soup afterwards. " Hardley results are below. You can see the full results here. Originally about 10 miles, this lovely course in the Pewsey Vale was revised and is now nearer 11 miles, the original two energy sapping climbs having been increased to four. Sadly, Alton Towers in Staffordshire proved to be no fairground attraction for the thousands of runners who competed on the day. It surely will go down in history as one of the muddiest cross country races in a generation. Just think of it as Glastonbury at its worst (times 2) !! The event was nearly called off due to the adverse weather (low wet mist and 2 degrees) and unbelievable underfoot conditions, and there were many injuries sustained in the early races, but eventually it was decided that the Senior Mens and Senior Womens races would go ahead but on revised and shorted courses (hooray !!). However, the depth and sheer quantity of mud, rendering virtually the entire course a quagmire, did ensure that the races provided the fiercest of challenges. Hardley Runners were represented on the day by 7 members and 1 support crew (thank you Rose), all of whom finished this tough course in admirable time. Over 1,300 runners took part in the senior mens race and over 550 in the senior ladies, which is one of the largest entries in many years. Finishing for Hardley were Mick Anglim 1090, Paul Carter 1142, Dave McElhenny 1148, Ray Noke 1273 and Ron Godden 1294. For the ladies Lindsey Godden 519 and Linda Noke 536. Miserable weather but an excellent result. Our women were first again and are first overall. Our men were second and are second overall. Well done! Well done to the four members who ventured over the Solent, ensuring we had a men's team for this HRRL race. Hardley results are below. You can see the full results here. The next HRRL event is the Bramley 20 which is ideal training for those planning a Spring marathon. The weather was cold but much better than last year and numbers were up overall but ours were down so we didn't manage to get into the team results this year. A pity becuase it was a good event and everyone who ran last year improved their time this year despite it being muddier. For Ray and Andy the improvement was dramatic; nearly a quarter of an hour. Within the grounds of the Broadlands Estate at the heart of Romsey, this new course taking in three laps gave competitors and spectators the ideal opportunity to take in the beautiful grounds and house. Hardley results are below. You can see the full results here. Hills and mud as tough as ever but cakes even better this year - had to add on an extra marquee to house them all as not enough room in main village hall - now that's what this running lark is all about! Congratulations to Sue Sleath who was 3rd lady and Viv Drake who was first FV55. Hardley results are below. You can see the full results here including a picture of Lisa going well. Conditions were good for this popular race though it was a bit windy on the sea front. Congratulations to Leonora on a new PB and to Malc who was 11th overall on age grading. Hardley results are below. You can see the full results here. There is an explanation of age grading on the Serpies website. This year's Championships took place at Fleming Park in Eastleigh on the site of the former golf course. The course was grass with the odd bit of mud to make it more interesting. The weather was fine and bright. 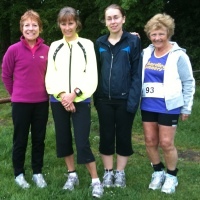 Congratulations to Jane Morgan who was first WV50 and to our women who were 7th team. Hardley results are below. You can see the full results here. Another win for the ladies. Well done! The course was excellent with enough mud to make it interesting and a killer hill at the end. Particular mention goes to Sue (I'm just going to jog round as I'm doing a long run afterwards) Sleath who managed (see pic) to get both feet off the ground at the finish despite the hill. Our Romsey friends took some excellent pictures. Just click on Sue's feet to see the album. Hardley results are below. You can see the full results here just as soon as Martin is able to publish them.